During last season's NBA Finals, LeBron James torched the Oklahoma City Thunder for 28.6 points, 10.2 rebounds and 7.4 assists per game. In the process, he captured his first ring and the MVP trophy. While there are still four months before a potential Finals rematch, OKC would be well served if they could devise a way to slow down James. 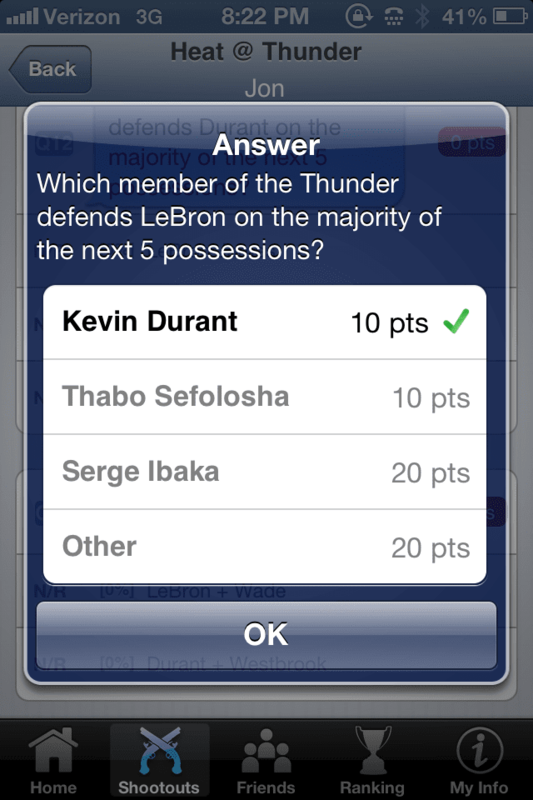 As this real-time SnapCall indicates, the Thunder have multiple options to cover LeBron. Oklahoma City head coach Scott Brooks' top choice is arguably Kevin Durant. KD has the ideal size and athleticism to cover LeBron, but his energy is better spent matching James on the offensive end. After all, Durant isn't the three-time defending scoring champ because of his defensive play. Guarding LeBron also exposes Durant to foul trouble. So while the answer to this SnapCall indicates that KD did in fact begin the game covering James, he assignment was quickly changed after picking up an early foul. How do the Thunder's other options stack up against LeBron? Serge Ibaka is one of the league's best defenders, but he isn't quick enough to cover James' perimeter game. Also, Ibaka's absence in the paint stretches the Thunder's defense, allowing for dribble-penetration and easy buckets. That leaves Thabo Sefolosha. The 6-foot-7 forward has the length, but not the strength to defend James. 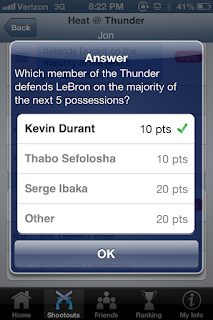 However, he is the Thunder's best option, if only because he is the most expendable player of the three. When it's all said and done though, like any great scorer, LeBron is capable of filling his stat line regardless of whether it's Ibaka, Durant or Sefolosha guarding him. Need proof? He dropped 39 points, pulled in 12 rebounds and dished out 7 assists in the Heat's 110-100 win.